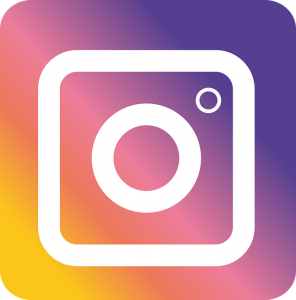 How to use the Colour of the Year 2018 in your home. Trends in decoration will continually come and go so long as we remain a creative animal, but the enduring appeal of surrounding ourselves with pattern has been in continuous use since the Neanderthals decorated their cave walls with hand stencils and geometric shapes. As a designer, I love to include pattern in all of my rooms; it can take decor to another level of interest, lifting a scheme from the ordinary to the spectacular! Some areas cry out for decoration more than others and the oft-overlooked oor, normally so neutral, can become a work of art with a little judicious pattern and colour. 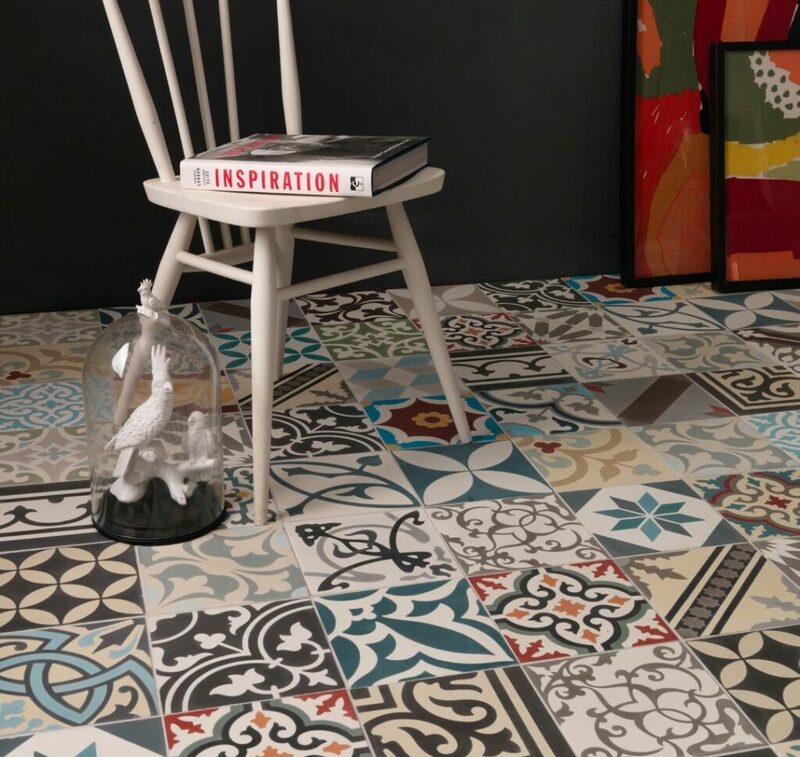 Encaustic tiles are perfect for flooring and come in a vast array of shapes and motifs including Moroccan-inspired, modern geometrics and stylised florals. But what exactly are encaustic tiles? They are cement tiles, handmade by skilled artisans with a traditional three-layer process (white cement, pigment and marble powder) that has been used since the 1800’s and passed from generation to generation. They are usually of two colours but a tile may be composed of as many as six. The pattern appears inlaid into the body of the tile, so that the design remains as the tile is worn down, creating a vintage charm that improves over time. There are lots of imitations on the market but few that are made using the traditional method. Statement-making and a joy to live with, it really depends on how creative you feel. They are most commonly laid using a single pattern for a contemporary look or as a fabulous random patchwork creating a rustic charm. 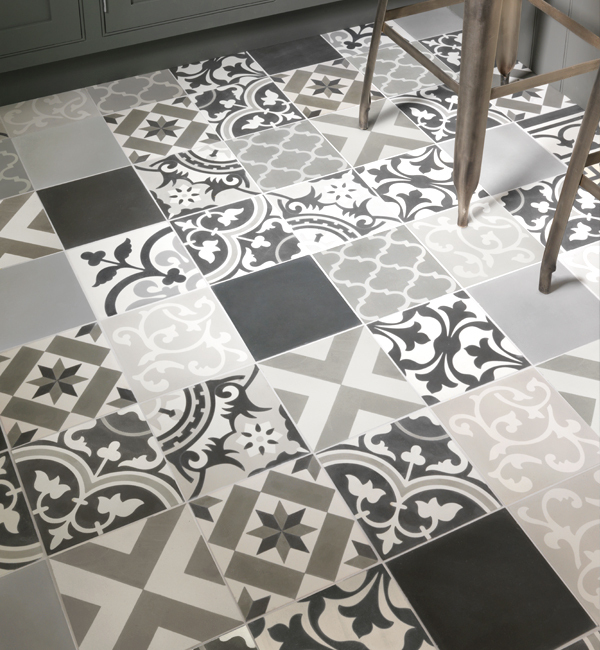 These patchwork tiles come in a range of rich, earthy colours and also a more subtle monochrome palette. They come pre-mixed and are laid in a random pattern, creating a delightful floor pastiche that begs to be noticed. If you are looking for a bold, contemporary look, then using a single tile design will add drama to any floor. 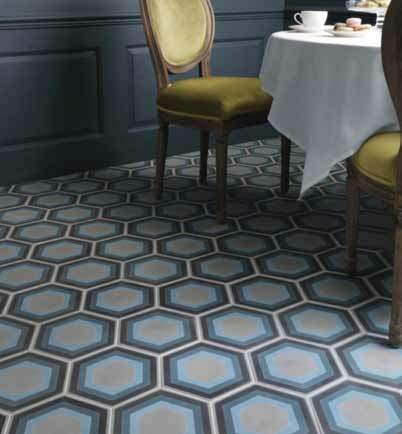 Geometric tiles look sensational and these striking hexagonal tiles in muted shades of grey and blue add depth to the floor. Picking a coordinating paint colour links the floor to the walls but additionally, the deep wall colour visually accentuates the floor – they work together in perfect harmony. By way of complete contrast, the two-tone blue and white floor tiles in this hallway combined with the white paintwork have a luminescent lightness, evocative of a Mediterranean interior. 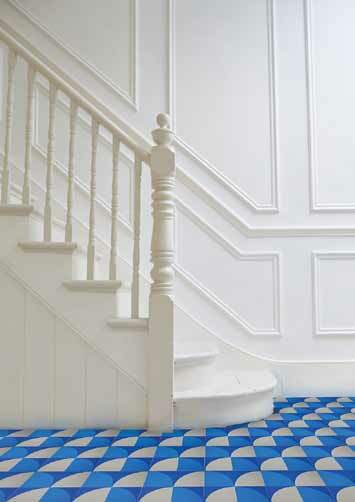 Contemporary blue and white encaustic tiles adding drama to a hallway. 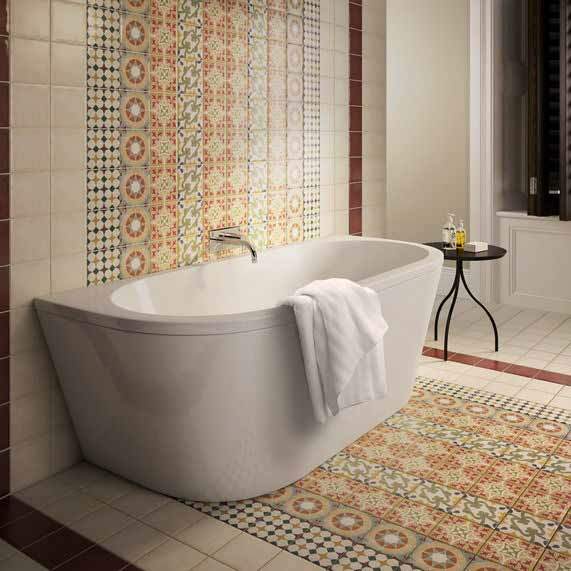 How about considering laying encaustic tiles to create real design features in the home. Using them to create visual ‘rugs’ or ‘runners’ looks incredible. In this bathroom, a breathtaking combination of patterned tiles sit centrally on the wall behind the bath and run underneath along the floor. Mixed with less adorned tiles will keep costs down but more importantly serves to highlight the areas with the pattern, and in turn, the designer bath. If colour is not your thing, a monochrome scheme will always look chic as this industrial style room perfectly demonstrates. 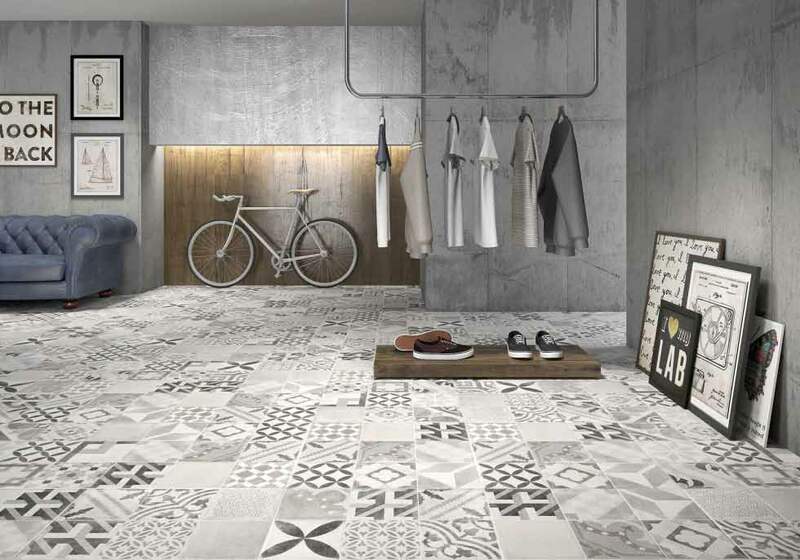 With a large floor space, and exposed concrete walls, the grey random patchwork tiles add just the right amount of pattern in what could otherwise have been a bland room. In this kitchen, a colourful patchwork of encaustics has been used as a piece of art on the wall, showing just how versatile these tiles can be. Mounted and framed in white painted wood, they add rustic but colourful charm to an otherwise neutral space. Note too how the woven table runner accentuates the tiles. With myraid ways to decorate using these innovative, modern decorative tiles, it is easy to incorporate them somewhere in your home and express your creativity and individuality. 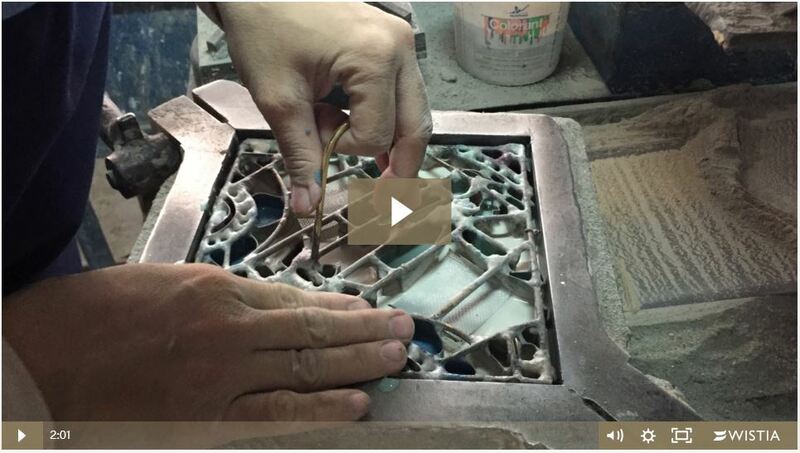 Hand made encaustic tiles are as long-lasting as they are beautiful with an attractive natural patina that gets better with age, and if you need any further convincing, have a look at what goes into the making of each exquisite tile… it’s a labour of love. 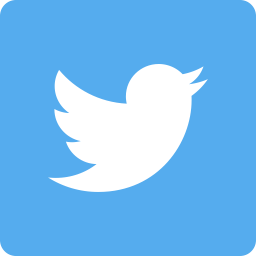 Find out more about our resident interior designers: Colliss & Quinton Ltd.
We are British designers Mandy Colliss and David Quinton. We have designed for global brands in graphics, 3D and packaging design but it is interior design and decoration that has long been our passion. Our designs have already been used to furnish and decorate homes, hotels, restaurants, cafés, show homes, hospitals and retail stores. Our new webshop will contain our latest collection of wallpapers, cushions, artworks, customised one-off pieces of furniture, accessories and lighting. Our designs will inspire and enhance traditional and modern architecture, creating glamorous, eclectic interiors.